Today’s contribution to the Learning Log is about experiential learning, and how we can transform life’s necessary little road trips into amazing learning experiences for our kids! My family and I were recently on our way back home from an event, and rather than take the short way home using the Interstate, we elected to travel down Highway 1 on the Central Coast of California. One of several adventures we were able to pack into the two-day trip home was a visit to stunning Hearst Castle, which is just a short ride up the hill from the town of San Simeon. While there, I was amazed to discover that William Hearst’s mom was quite the Life Guide! Apparently, when little William was 10-years-old, he and his mother went on a very extravagant one and a half year journey to Europe, including stops in England, Italy, and Spain. It was on this trip that William was exposed to and gained a great interest in European architecture, culture, and art. This early exposure inspired a life long passion and interest in these topics. Within two weeks of receiving his inheritance as an adult, he began to build his own European castle on the family’s ranch in California. While William Hearst, who was the son of a wealthy silver miner and ultimately the owner of a vast newspaper empire, didn’t lead a very normal life, his story does show how much impact we Life Guides can have on our children by exposing them to the world at a young age. So… whenever you have the chance, I would encourage all of you to “take the long way home” if possible and share little moments of learning with your kids while you are just out and about! Also, here are a few ideas if you ever have the chance to travel down Highway 1 on the Central Coast of California someday. 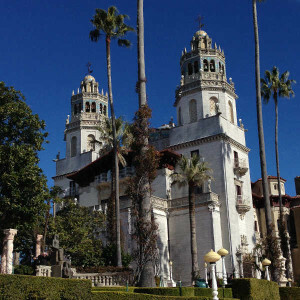 Visit Hearst Castle! The visit is a great way to learn a little bit about U.S. and California history, and they also have a beautiful collection of European art! Go see the Elephant Seals! If you’re there during the winter, thousands of elephant seals are on the beach just a few miles north of San Simeon giving birth and mating prior to their year long journey in the ocean. Check out the Carmel Mission! The second oldest of Father Junipera Serra’s missions is one of the most beautiful representations of how he helped the Spanish settle the state. Visit the Custom House in Monterey! You can learn about the early history of trade here in what was the first government building in the first capital of California. Check out the Treebones Resort! We stumbled across the “glamping” place while preparing for our trip. Their yurts have some amazing views over the coastal cliffs! Let me know about your Experiential Learning places! We love traveling, and I’d like to discover new learning spots to share with my kids from all of you!